Nuance Power PDF Standard for Mac is the easiest and most accurate way for demanding PDF users to gain control over PDF files. Create, edit and assemble documents that follow the new PDF 2.0 industry standard document format with the right features for searching, editing and sharing through your favourite cloud service. Use the advanced redaction capabilities to automatically inspect documents and remove sensitive data for safe, secure document sharing. 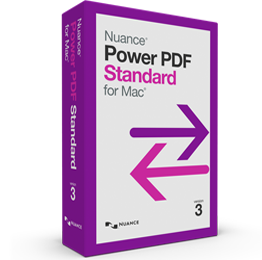 Nuance Power PDF Standard for Mac is the leading PDF solution for home and small office use that delivers ease of use and accuracy at an amazing value, freeing you from the compromises of traditional PDF software. Don’t retype your documents: If you must work with PDF documents in other applications, don’t waste valuable time recreating them – convert them. Complex layouts with columns, tables and graphics are accurately and faithfully reproduced in Microsoft® Word. Combine and assemble documents with ease: Combine files and remove or replace pages with drag and drop ease. View and select pages from a source document – such as Word, Excel, PowerPoint, JPG, BMP or TIF or XPS – to insert into a target document. Just drag and drop the pages to add them into the PDF file, then swap or duplicate a page, or range of pages, when needed. Turn papers into PDFs more accurately: Create PDF files directly from your scanner with time-saving scanning to Searchable PDF. Collaborate like never before: Exchange ideas and provide directions by adding notes, text boxes, graphics and more to PDF documents. Mark up documents with highlighting, underscoring and strikethrough formatting. Create custom stamps and apply them on your documents. Redact Personal Information: Eliminate sensitive information from documents by redacting or erasing text in any PDF file. Enhance document security: Ensure compliance with government regulations regarding document security by safeguarding confidential information with 128-bit or 266-bit AES encryption and 266-bit AES Unicode passwords. Connect your documents to the Cloud: Now you can save and access your stored documents in the cloud by connecting directly to iCloud, Dropbox and Evernote. This gives you access to your documents anytime, anywhere through the Web or by the applications of supported mobile devices. Create, fill and sign forms: Don’t let the hassle of filling out long forms slow down your business. Validate digital signatures for authenticity and trust of digitally signed documents Digitally sign documents using AATL or create a self-signed certificate. Create and fill out interactive PDF forms and sign them. Apply business-related and sign here stamps via the Library. Organise a PDF document with a table of contents: Now you can easily create and edit a table of contents – and save time in the process. You can even add chapter and subchapter titles to make your PDF a breeze to navigate. Convert website content into a multi-page PDF: Take HTML pages from websites online and create a PDF document that includes all the web pages, complete with hyperlinks. The new PDF 2.0 standard focuses on the file format, assuring both compatibility and security with programs utilising and manipulating the file. Be assured that you’re creating the most compatible and secure PDF documents possible with the new Power PDF. Add text and image watermarks with opacity and rotation controls, as well as custom page range options. Use watermarks to identify draft or confidential in-house documents, assert copyright, or clarify intended distribution. Apply header and footer text with options for customising page position, fonts, and page range. Turn multiple scans into searchable documents all at once. Power PDF for Mac now supports moving, resizing, and deleting line art and text blocks. This new tool maintains or decreases file size when moving, resizing and deleting images. Export to JPEG, PNG, 1-bit TIFF and flattened PDF. Create the most optimised output by choosing to save in greyscale, split PDFs into single page TIFFs and select from 72 to 600 dpi. Internet connection required for conversion to PowerPoint or PDF/A formats.